The T-Mobile Sidekick iD handset is on its way. The new low-priced variation of the Sidekick range cuts back on some features seen on the Sidekick 3 though. There’s no Bluetooth, EDGE high-speed data, memory card slot, camera, or USB connectivity, but you’ll still get the cool swiveling screen and QWERTY keyboard combo. 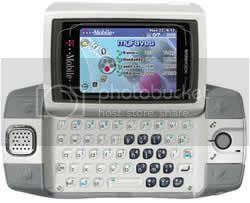 The T-Mobile Sidekick iD also features a 2.4″ landscape TFT LCD display with 240×160 pixel resolution, full HTML compatible web browser, and support for AIM, Yahoo!, and Windows Live Messenger IM services. As we saw already, the Sidekick iD is colourful, with user-changeable skins available to get your style on. Colors include black, yellow, blue, white, purple, and glow-in-the-dark. T-Mobile lets the Sidekick iD loose on April 25 for $99.99 (USD) with a two-year service agreement and mail-in rebate.